Were universities, think tanks and the mainstream media to be believed, science halted all advances in 1970. All “magic” has gone into video games and mobile devices while gas guzzling pickup trucks and fake cancer treatments remain virtually unchanged. The moon remains “unvisited” and Mars, intended to be visited by 1990, remains yet illusory. The truth, a very dark truth, goes further, so much further, buried in a realm of disinformation, fakery and deception. Is there technology out there than is kept from us, have we been lied to as part of a massive conspiracy? Not only is the answer a resounding “yes,” keeping the lid on this very real fact has proven impossible. Suppressing dissent, however, is easy. The technology that we can’t know about is also the technology that keeps the world silent and uninformed. Welcome to a world even Orwell never imagined. There are a few recent incidents where classified, deniable and despicable projects using suppressed or banned science have gained some public note. Only when the nature or impact of these events crosses a “red line,” are questions asked. We begin. There is a current swine flu outbreak in China. The version of swine flu is not native to China but rather one studied, and our informed sources say “developed” as well, at the Lugar Laboratories in Tbilisi, Georgia. Recent media reports have questioned the role of this US Department of Defense funded facility in the role of biological and chemical weapons development. With each accusation, including a major release of documentary evidence by the former Chief of Intelligence for the Republic of Georgia, press assets flood the media with a torrent of hapless denials. This one instance, however, a manufactured disease traveling thousands of miles without a disease vector or “patient zero,” gives rise to accusations of germ warfare. That the US is currently involved in an economic war with China and has a long history of using biological weapons against crops and livestock since the end of World War II, points a finger at Washington. When you add stealth drone technology to weaponized biological agents, combine that with control of the press and the ability to manipulate public opinion, add a dash of extremism and psychopathy, everything becomes possible. Our second subsets of observable but deniable phenomenon involves Syria and Yemen. Our sources tell us that both nations, targeted by the triumvirate of the United States, Saudi Arabia and the State of Israel, have been subjected to biological, chemical and radiological warfare. Anonymous sources within the defense community cite a Department of Defense/US Department of Energy project to develop deniable MRR (Minimum Residual Radiation) nuclear weapons to be deployed as “glide bombs” by the new F35 stealth fighter bomber. The project basis is a modification of the W 54 SADM (Special Atomic Demolition) developed by the Los Alamos Scientific Laboratory between 1957 and 1959. Using football shaped hollow core nuclear pits of either Uranium 235 or Plutonium 239, designs were developed with an output as low as .1 kilotons up to .4 kilotons. The deployment of these nuclear weapons, weighting less than 200 pounds, as glide bombs on drone aircraft, is said to be among the listed objections given by the Russian government to the United States in response to American accusation regarding the range of Russia’s Iskandar missile system. Similar “bleed through” comes in Russia’s written objections to US programs involved in the covert collection of DNA samples from hundreds of thousands of Russian citizens. In each case, the projects involve “dark science,” using genetically modified organisms or deployment and testing of banned radiological weapons. Were one to question issues of “intent,” the collected communication between the Russian and American representatives at the UN Security Council over the use of banned chemical weapons inside Syria, Chlorine and Sarin gas by name, or British accusations against Russia for the alleged use of Novochuk/VZ gas clearly open the door for wider consideration. We will, thus, open the door even further. 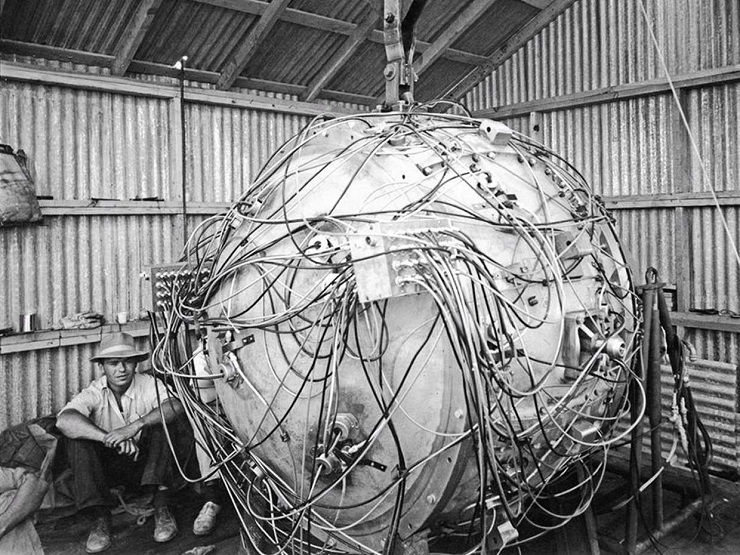 Between 1942 and 1945, the largest government backed scientific endeavor in history brought about the development of the first nuclear weapons. Hundreds of thousands of pages of documents from the Manhattan Project are still classified but a number of issues other than bomb development ensued. The Manhattan Project went a bit further. Study groups with infinite funding, led by Nobel Prize winners, reviewed the work of the Cavendish Laboratories and Maxwell’s Equations along with the works of Tesla. The following areas of study, often under DARPA (Defense Advanced Research Projects Agency) or other “deep cover” activities such as agricultural or medical research, even science fiction can be eclipsed. Weather modification – DARPA projects using microwave and other methodologies has been deployed to manipulate weather fronts, the jet stream, rainfall and other factors in order to impact fuel, food and transportation costs. Weaponization capabilities have been explored under well financed DOD programs but there is no evidence of deployment. Thought Control – Often considered a “tin foil hat” subject, current advances in physics and medicine have isolated brain functions susceptible to external stimuli. Platform base deployment and testing of “inducement” technologies, in Africa and the Middle East have been done by corporation such as Elbit or Lockheed. Programs are funded under projects tied to extremism and terrorism. Returning to Manhattan Project based technologies, two basic areas come to mind involving widespread suppression of potential scientific advances that might well advance the human condition. There have long been rumors that the Nazi’s worked with alien technology to develop aircraft with unique possibilities. In support of this hypothesis, stories of alien bases in Antarctica and Chile have long been the subject of speculative fiction. However, behind this “tin foil hat” approach lies more than one kernel of truth. When German Major General Walter Dornberger came to the United States to take over America’s primitive rocket program, more came with Dornberger than Werner Von Braun. German scientists had also done basic research into gravity. “According to M. Mathis and other modern theorists a unified field equation only has to unify two separate fields in order to qualify as a unified field. It does not have to unify all four fields. Both Newton and Coulomb formulas are unified field equations. That is why the two equations look so much alike. They are basically the inverse of each other. However the two equations unify the same thing in different ways. Newton was unaware of Maxwell’s E/M field, so he did not realize that his equation contained two fields , “E/M” and “G”, (electro-magnetic and gravity). Coulomb working on electrostatics, pre-Maxwell, likewise did not realize that his equation also included gravity. So the E/M field is hidden inside Newton’s equation, and the gravitational field is hidden inside Coulomb’s equation. Both Maxwell and Einstein missed this unification. If we look at Newton’s equation first…F = GMm/r2 … we learn that this equation has been around since 1687. But how can you get two fields from one when only mass is involved? Well, remember that Newton invented the modern idea of mass with this equation. But he let the variable “M” stand for what we now call mass. In the process he compressed the equation too much. By 1953, Lockheed had built, according to White House sources, a primitive anti-gravity craft using German technology, as a test platform. The craft, nearly as large as a B 52 Stratofortress, proved mercury-based gravity theory. I viewed the craft in 2009, then capable of attaining altitudes of up to 20 feet, hardly a UFO. Similar attempts to manipulate gravity involve the works of Canadian engineer, Gerald Bull, assassinated by Mossad agents in 1990. Bull developed a type of “weight loss” or “gravity reduction” field technology using thorium coatings under a specific charge. This technology allowed 155mm artillery to increase range from 12 to up to 40 and even 60 kilometers and, according to Bull, would even enable artillery to launch earth satellites. Bull’s discoveries eventually led to his untimely death. The “elephant in the room” of suppressed technologies is Cold Fusion. Supposedly “debunked,” how that term is abused,” by “media scientists,” DARPA Cold Fusion projects draw just under half a billion in yearly financing. Though Cold Fusion is “debunked,” the US Navy is testing Cold Fusion technology in a number of its craft. Another suppressed technology is the history of the first linear accelerators or “atom smashers.” When physicists look at photos of Tesla’s Colorado laboratory from back in 1905, photos with Tesla sitting in a cage next to a giant coil, experts recognize the first million-volt particle accelerator or cyclotron. Tesla’s materials, still classified to this day, helped the US develop its first magnetic uranium separators and, even more interesting, capabilities of transmuting elements. Yes, we are talking about alchemy. Tesla’s discoveries eventually led to his untimely death and the suppression of his technologies. More recently, the search for “over unity” devices, those capable of emitting more power than they receive, is the holy grail. Leading this effort is Mehran Tavakoli Keshe, an Iranian born physicist whose research essentially follows Tesla. Tesla claimed to be able to tap electrical power from “aether” just as Tesla had done. In order to do this, he developed coils coated with nanoparticles. In testing, some never worked, but inexplicably, some have powered homes for years. Keshe himself is evasive but his technology has drawn investment from governments such as China and others. Can Keshe’s plasma field’s disable nuclear missiles as claimed? The scientific community is divided on this issue, a division Keshe himself fuels with controversy. Real or fake, Keshe has survived two assassination attempts and maintains a significant security capability. In the minds of most people, a nuclear weapon is a large device carried on the tip of an ICBM or carried in the belly of a huge bomber aircraft that when deployed produces a colossal explosion and spectacular mushroom cloud just like all those terrifying 1950s newsreels. What has become clear is that the same physics that makes tiny nuclear bombs can also produce tiny fusion reactors as well, clean and cheap energy for the most remote regions of the world. Similarly, the suppressed gravity discoveries could revolutionize transportation, in fact every aspect of engineering and physics. Need we examine the breadth of suppression and deception? How far does the story go? What diseases could have been eliminated, what suffering ended, what advances, what enlightenment made possible? Could advances in science, as believed by the “technocrats” of the 1930s, have brought about a new society, a “new man,” with an end to disease, hunger and war?